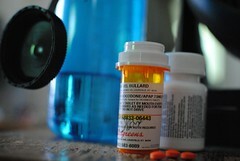 Opiate dependence is a major concern in the field of medicine. At the University of Michigan, a team of scientists have identified a new approach to pain therapy which may lead to lower-dose painkillers, reducing the risk of opiate dependence. Dependence is usually the result of patients developing a tolerance to common painkillers like hydrocodone or morphine, which means that the patient requires a higher dose of the drug to achieve the effect they once experienced when they first started taking a medication. “We have for the first time discovered compounds that bind to an alternative site on the nerve opioid receptors and that have significant potential to enhance the drug’s positive impact without increasing negative side effects,” researcher John Traynor, PhD, said in a news release. The compounds potentially could work with the body’s own natural painkillers to manage pain, he stated. Scientists are still in the early stages of research, according to Traynor. “This opens the door to developing pain relief medications that require lower doses to be effective, helping address the serious issues of tolerance and dependence that we see with conventional pain therapy”. The research has been published in Proceedings of the National Academy of Sciences of the United States of America.